Did you fall in love with the first Draper James x Eloquii collection? We did too and that love can be relived because they’ve just dropped their summer collection Hello Darling! Check out this epic collab inside! Whether you plan to summer at Martha’s Vineyard or only plan to in your imagination, we’ve got the perfect collection for you! We announced Draper James for ELOQUII back in March and to say it did well is quite the understatement! After a successful sold-out collection, Draper James for ELOQUII is back with its new Hello Darling summer collection. This one is filled with ladylike dresses and separates, made with a nautical color palette and whimsical patterns. Draper James for ELOQUII’s New Hello Darling Collection Is A Nautical Delight! “It’s been such a fun and rewarding experience to work with ELOQUII on the collaboration. We are thrilled to invite more women into the family with the Draper James for ELOQUII collection,” said Reese Witherspoon, Creative Director & Founder of Draper James. 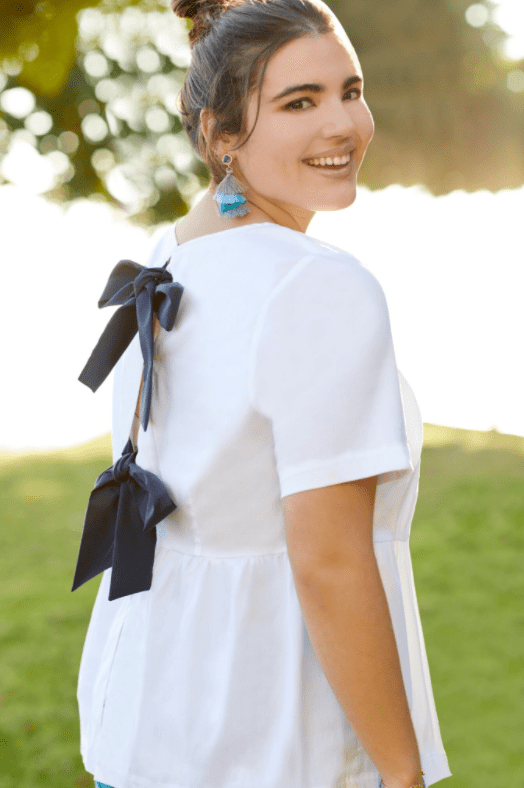 The Hello Darling collection has an array of dresses, tops, bottoms and accessories ranging from $18-$225! Sizes range from 12-28. Some styles of note include the Tennessee Tweet Dress, Stripe Wrap Dress Draper James for ELOQUII Gingham Blocked Fit & Flare Dress and the Chambray Dress. You can snag the collection in ELOQUII stores and ELOQUII.com with select items sold on DraperJames.com and RentTheRunway.com. So many choices! Oh, and that ain’t it! ELOQUII, Draper James and Rent the Runway have partnered to provide one lucky winner and their guest the experience of Reese Witherspoon’s version of Nashville, Tennessee. The Ultimate Nashville Trip sweepstakes includes a 2-night stay for 2 people at the Thompson Hotel, $750 Amex Card for airfare, $200 gift cards to dine at Reese’s favorite restaurants, as well as a $1,000 gift card to both Draper James and ELOQUII along with a 6 month membership to RTR Unlimited from Rent the Runway. Makes sense, right?! You gotta have somewhere special to wear your new digs! Shop the Draper James for ELOQUII Hello Darling collection at ELOQUII.com! Eloquii and Draper James have been some of the best collaborations in brands we’ve seen in plus this year! Their first collaboration gave us flirty dresses and pieces to wear to kick spring off and this collection is giving us pieces to wear well into the summer! But we have to ask: what pieces, from both collections, are you feeling the most? Memorial Day 2018: The Best Plus Size Fashion Sales, Deals & Offers!